The school year is ready to begin. Mount Saint Mary College is about to enter its new and next academic term. The teachers are getting their lesson plans ready and the students are getting ready new books and materials for the year. But now, there is a new feeling of confidence and leadership in the air. It is present within everyone here. It resonants all across the campus and beyond. This new aura is all thanks to our new college president. During the summer of 2018, our seventh college president Dr. Jason Adsit was hired and welcomed to our community with open arms and support. Much of the Mount community is happy that Dr. Adsit and his family have come to be a staple of our school, and he returns the embrace with enthusiasm. 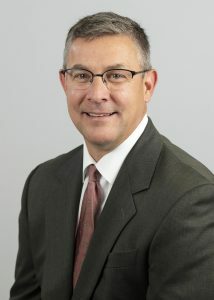 Dr. Jason Adsit is successor to the interim president Dr. David Kennett, who served from 2016 to 2018. Dr. Kennett was truly grateful to have served the Mount and now looks to pursue new ventures. With Dr. Adsit’s arrival on campus this past summer he faced major issues right out of the gate of his semester. During the fall semester, the female freshmen residence building of Sakac Hall was affected by a severe case of mold, which was a common occurrence over the summer and fall throughout the Hudson Valley. The Sakac situation affected everyone on campus, but Dr. Adsit was ready to help. “When you do become a president, there will be one if not two things that drop into your lap in your first six months there,” said Adsit. Dr. Adsit has been working closely and carefully with all of campus to help make the situation controllable for all who have been affected; safety is his highest concern and priority. Tackling this situation will take time but Dr. Adsit hopes that once this situation is handled, we will not have to repeat it again. “I’m preaching patience,” he said. Speaking on the community as a whole, Dr. Adsit credits the students for being resilient in these difficult times. However, he also thanks the students for being present and open with him. 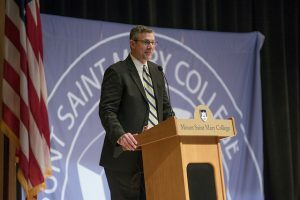 Dr. Adsit said that he has “good moments every single day” at the Mount, which firmly solidifies that he was the right choice as a leader for the school. “This is a year that I wanted to listen and learn,” said Adsit, who has been working with much of the mount community to do just that. In addition to learning about the Mount and the greater community, Adsit is gearing up for the Mount’s future by working across campus to create a stronger institution.